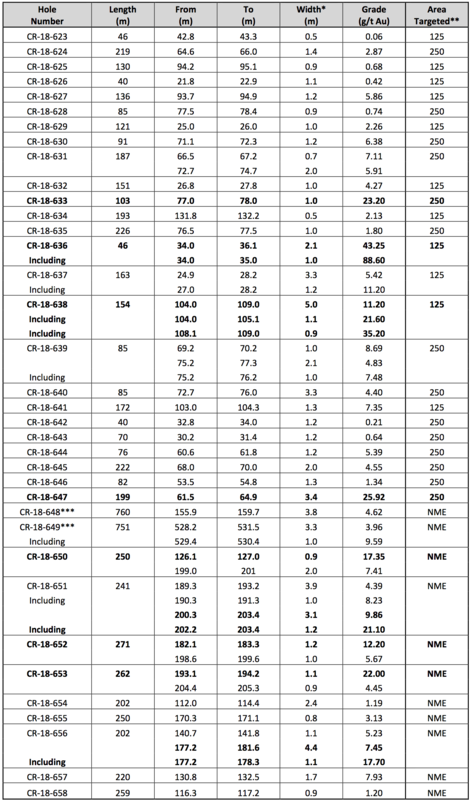 Montreal, Quebec, Canada, October 4, 2018 – MONARQUES GOLD CORPORATION (“Monarques” or the “Corporation”) (TSXV: MQR) (OTCMKTS: MRQRF) (FRANKFURT: MR7) is pleased to report additional assay results from the 2018 diamond drilling program at its wholly owned Croinor Gold project 50 kilometres east of Val-d’Or, Québec. The initial 20,000-metre program started in March 2018 and focused on the expansion and infilling of the Croinor Gold deposit. The program was completed in early September with a total of 19,935 metres of core drilled in 89 holes. Drilling continued with one rig on the property and a second drill was added on September 17 to drill an additional 8,300 metres before the winter freeze. 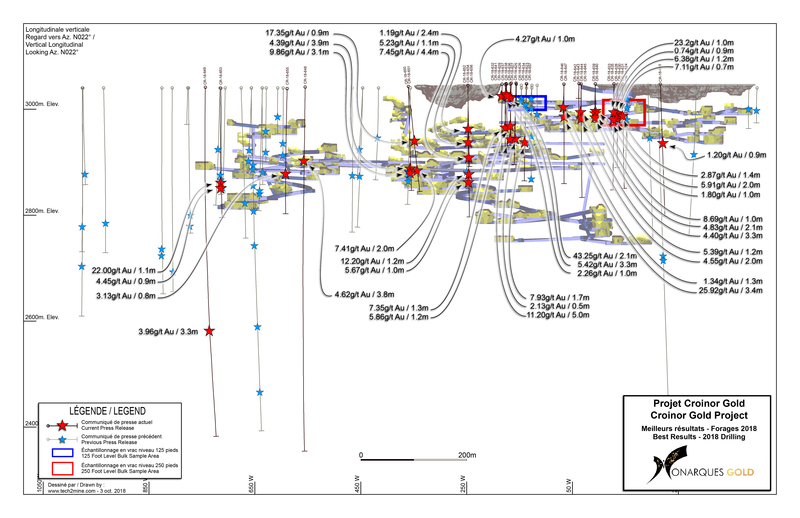 The Phase 3 results are from a total of 6,790 metres of drilling in 36 holes (see longitudinal view). Assays have been received for 77 of the 89 holes drilled and logged (see table below and press releases dated July 10, 2018 and September 5, 2018). The first 25 holes in the table below are from the two areas targeted for bulk sampling, on the 125-foot level and the 250-foot level of the old mine workings. These holes are infill and contour drill holes for the two zones, with a grid spacing of 10 metres by 10 metres, considering historical holes and holes drilled previously by Monarques. Hole CR-18-636 returned 43.25 g/t Au over 2.1 metres, including 88.60 g/t Au over 1.0 metre in the 125-foot level bulk sample area, and Hole CR-18-647 returned 25.92 g/t Au over 3.4 metres in the 250-foot level bulk sample area. Both these holes have increased the volume of ore planned to be mined. New wireframes for each area are being completed by an external consultant. Near-mine exploration drilling has consistently returned positive results, with 8 of the 11 holes returning economic assays. Hole CR-18-653, drilled 41 metres up plunge from the nearest planned stope, returned 22.00 g/t Au over 1.1 metres, indicating that the gold system is still open to the west. Hole CR-18-649 is a down dip hole drilled into the host diorite to test the deposit at depth and returned 9.59 g/t Au over 1.0 metre, indicating that the deposit is still open at depth. * The width shown is the core length. True width is estimated to be 90-95% of the core length. ** 125=125 Foot Level Bulk Sample; 250=250 Foot Level Bulk Sample; NME=Near Mine Exploration. *** Holes CR-18-648 and CR-18-649 were drilled down dip, parallel to the diorite, to test for the presence of multiple directions of quartz veining. The width shown is the core length. True width is estimated to be 30-35% of the core length. Sampling normally consists of sawing the core into two equal halves along its main axis and shipping one of the halves to the ALS Minerals laboratory in Val-d'Or for assaying. The samples are crushed, pulverized and assayed by fire assay with atomic absorption finish. Results exceeding 3.0 g/t are re-assayed using the gravity method, and samples containing gold grains are assayed using the metallic sieve method. Monarques uses a comprehensive QA/QC protocol, including the insertion of standards, blanks and duplicates. The technical and scientific content of this press release has been reviewed and approved by Ronald G. Leber, P.Geo., the Corporation’s qualified person under National Instrument 43-101. Monarques Gold Corporation (TSXV: MQR) is an emerging gold mining company focused on pursuing growth through its large portfolio of high-quality projects in the Abitibi mining camp in Quebec, Canada. The Corporation currently owns close to 300 km² of gold properties (see map), including the Wasamac deposit (measured and indicated resource of 2.6 million ounces of gold), the Beaufor Mine, the Croinor Gold (see video), McKenzie Break and Swanson advanced projects and the Camflo and Beacon mills, as well as five promising exploration projects. It also offers custom milling services out of its 1,600 tonne-per-day Camflo mill.